To overcome energy supply shortages and price spikes by fueling more than half of their school bus fleet with abundant, domestic propane autogas. Approximately $5,000 per bus per year in operational savings. $79,000 per bus, equaling more than $5 million in fuel and maintenance savings over the lifetime of the fleet. More than 60 percent fuel savings per gallon when compared to diesel fuel. About 152,700 fewer pounds of carbon dioxide emitted per bus, per year. Following the 1970s energy crisis, Alvin Independent School District (ISD), Texas, began researching alternative fuel options. A decade later, as fuel access and pricing began hindering the district’s transportation department, the district turned to propane autogas to power its school bus fleet. Today, Alvin ISD operates more than 100 propane autogas school buses that travel nearly 1 million miles each year combined. 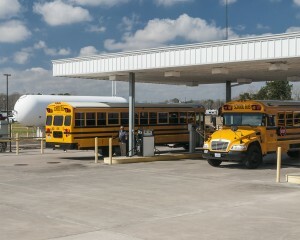 Currently, more than half of Alvin ISD’s school bus fleet operates on propane autogas. This includes 68 dedicated Blue Bird Propane-Powered Vision Type C buses and 36 converted buses. The remaining fleet is made up of 80 diesel buses. According to Juan Mejias, fleet manager for Alvin ISD, drivers have developed a preference for the propane autogas buses. And, the district relies on the buses’ power and ease of maintenance. After three decades of using propane autogas, the district has witnessed noticeable improvements in engine technology. Each new Blue Bird Propane-Powered Vision bus is equipped with a ROUSH CleanTech liquid propane autogas fuel system and a powerful Ford 6.8-liter, V10 engine. Mejias reports they deliver top-of-the-line serviceability in addition to cost savings. On average, Alvin ISD retires its buses every 13 to 14 years, with each propane autogas bus running approximately 270,000 to 280,000 miles during its lifetime. When maintenance costs, such as routine oil changes, are calculated over the lifetime of the bus, savings with propane autogas versus conventional fuels compound quickly. 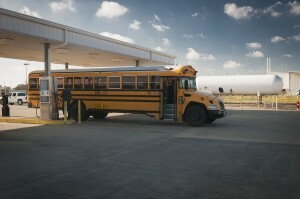 Savings in maintenance and oil changes can add up quickly with a large bus fleet like Alvin ISD’s. When the district adds its lower fuel cost into the calculation, Alvin ISD easily doubles its total savings with propane autogas. “We’ve been using this alternative fuel for decades, and we have always seen substantial cost savings, with or without federal tax credits,” Mejias said. Alvin ISD currently pays $1.31 per gallon for propane autogas versus $2.98 for diesel. In a head-to-head comparison between 56 of the district’s propane autogas buses and 56 diesel buses, propane autogas saves the district more than 20 cents for every mile driven. The fleet of propane autogas buses travels nearly 500,000 more miles than the diesel buses. An onsite refueling station saves the district even more in both time and money. The district recently used an $80,000 grant to upgrade to a higher volume pump and dispenser to service its growing propane autogas fleet. Alvin ISD currently operates an 18,000-gallon propane tank with three dual dispensers, allowing them to fuel six buses at the same time. Mejias credits the service of their propane retailers with providing reliable around-the-clock service for the district, eliminating supply issues of previous decades. Alvin ISD has experienced many long-term financial benefits by fueling with propane autogas. The district’s alternative fuel buses help them achieve state environmental standards, too. Propane autogas buses burn cleaner than conventional fuels and are exempt from state idling restrictions and emissions testing. Alvin ISD’s fleet also meets all Texas Clean School Bus Program requirements set by the Texas Commission on Environmental Quality. Propane autogas fueled buses emit 40 percent fewer smog-forming hydrocarbon emissions than gasoline, and 80 percent fewer than older diesel engines. On board, the buses boast a safer ride to school as noise levels are decreased when compared to diesel counterparts, giving drivers fewer distractions. Alvin ISD plans to take delivery of 15 more Blue Bird Propane-Powered Vision buses in March 2014.